This Gem of a Home has to be seen in person to be fully appreciated! Top of the World Panoramic Vistas! The Perfect Home for Entertaining! Gorgeous landscaping, serene sitting areas! 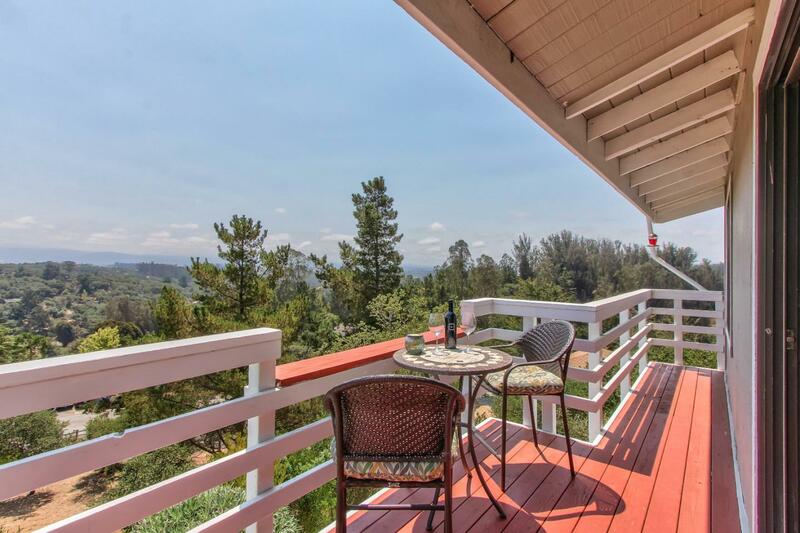 Gorgeous 360 Views Include mountain peaks and Moss Landing. It's a park-like setting surrounding this home. Elevated at the end of private road above the rest of the neighborhood, Easy commute to Silicon Valley, Ample room with lots of parking. Open Foyer/Sunroom & Oak Spiral Staircase. Large Living Room with Gorgeous Open Beam Cathedral Ceiling and French Doors add lots of sunlight. Master Bedroom with Great Views, Guest Bedroom also has Amazing Views, Great Wrap Around Deck Upstairs, Wonderful Outside Private Paved Patio with Firepit, Wood Burning Fireplace, Tile & Laminate Flooring, Built in Shelving and Pantry off Kitchen, Formal Dining Room, Space Saver Kitchen with 4 Bar Stool Counter, Solar Power. This is someone's dream home waiting for them to discover!